Ah, the mysteries of the palate. In this follow-up to his breakout picture book Even Monsters Need Haircuts, for readers up to 7, Matthew McElligott brings back the young barber in a new tale about culinary concoctions. Our small hero creates treats that no one on earth would eat (an Eggplant, Mustard, and Lemonade Smoothie, for example), so his new snack stand seems doomed to failure. But late that night, a glowing saucer descends and a little green man steps up hopefully to the counter; it turns out that our chef has a talent for out-of-this-world flavors, and word gets out around the galaxy. 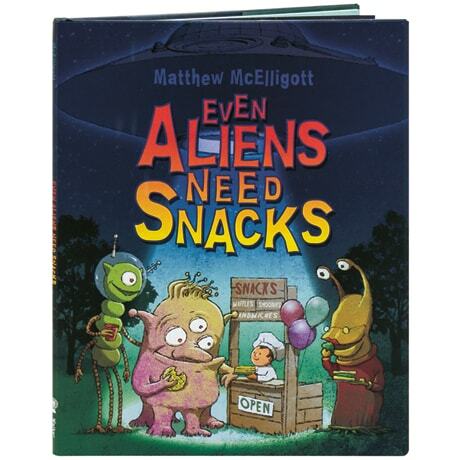 In McElligott's delightfully wacky sci-fi fantasy, we even see the snack stand's five-star review in an alien restaurant guide.